Last night, Thomas and I went out for a night in DC and we hit up our all time favorite sushi restaurant: Kaz Sushi Bistro. Their sign on the street is small and understated; it would be easy to walk right by this place every day and never really notice it. When you enter the doors, the restaurant is simply and tastefully decorated, nothing too spectacular or unusual. One things that does always strike me about this place is that there is always a large group of Japanese patrons in the dining room, enjoying lots of sushi and sounding like they are involved in fascinating conversation. When you open the menu, you immediately realize you are in for a treat. This is no normal sushi joint–the places that seem to have popped up all over American shopping centers these days–this is a place that has some culinary chops and a chef who really knows what he’s doing. A sake poached sea scallop with lemon and cilantro beckons with it’s creamy texture and delicate flavor, an eel roll surprises with the crunch and tang of pickled japanese radish and yellowtail nigiri melts on your tongue. On top of all that, there are two elements at Kaz that are overlooked at many sushi restaurants: the soy sauce and the rice. 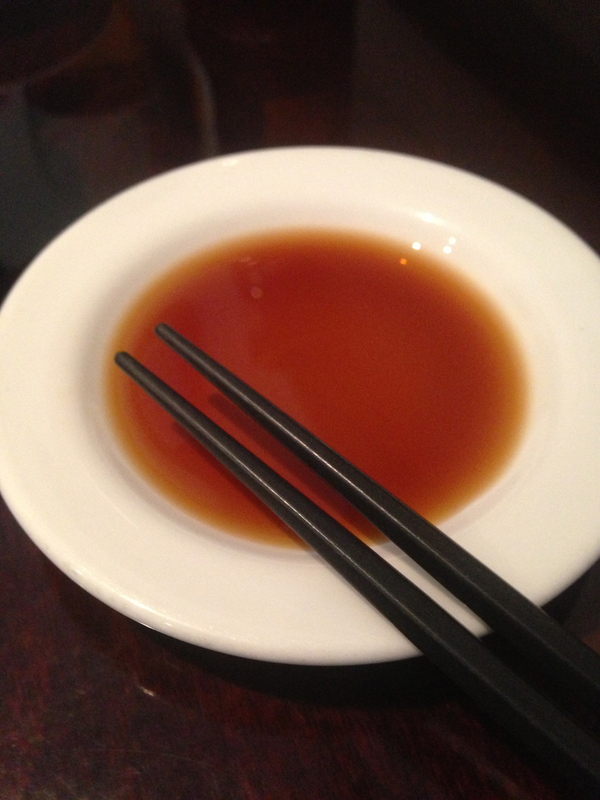 The soy sauce is actually made in house–no kikkoman bottles here. It is the very definition of unami–it has a wine-like quality and fills your mouth with an earthy saltiness. Many Americans would be surprised to know that the word “sushi” actually has nothing to do with the raw fish–it actually refers to the vinegar rice, which, ironically, is not much to write home about in most sushi restaurants. Kaz is different. They take so much pride in their rice that they disclose the type they use on the menu (100%Koshihikari). 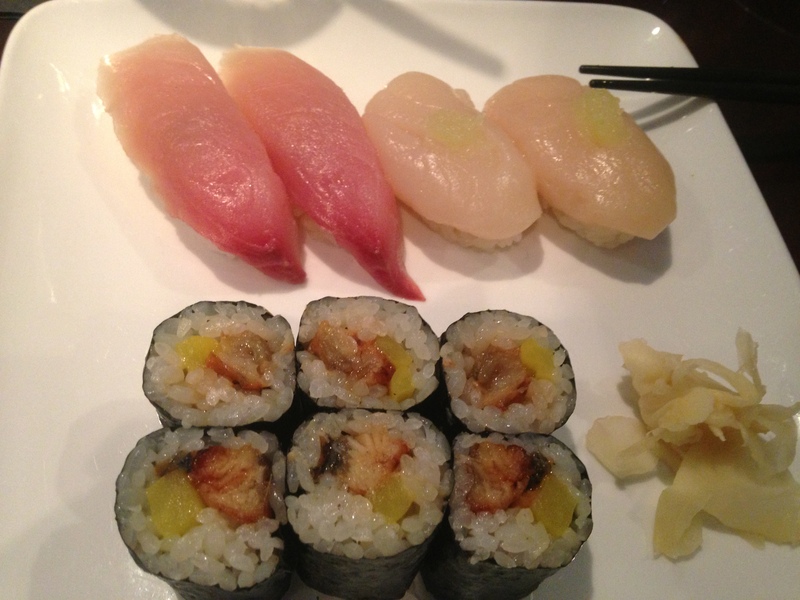 The rice is best highlighted in the nigiri, in contrast to the soft fish the rice almost pops in your mouth. It brings to mind the luxury of caviar and really does become a sensual experience. It is slightly tart, perfectly firm with a nice chew that works all around your mouth. Sushi is definitely the star at Kaz, but they also have small plates and excellent drinks. 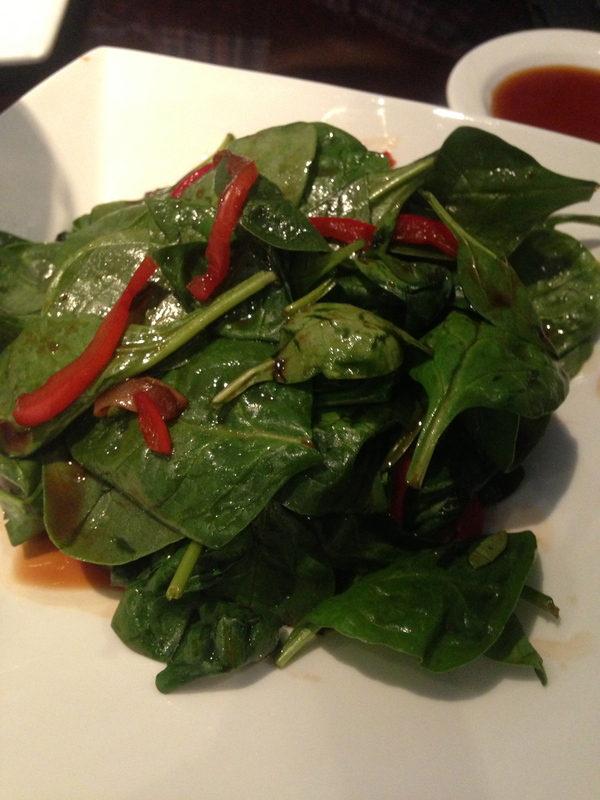 I highly recommend the warm mushroom and baby spinach salad with black bean sauce–warm shiitake mushrooms are nestled underneath a salad of baby spinach and slivers of red pepper. My favorite drink here is the shoshu margarita–a clever multicultural mix that packs a heavy punch. Some elements of the experience can feel a little manufactured–hot towels arrive in crinkly, printed packages and side dishes have the restaurant’s name printed on them–but the overall experience transports your tastebuds to a bistro in Japan and is highly recommended.